People are sick and tired of paid ads. Push marketing has trended out. Instead, top digital communities and companies are pulling traffic to their site using unique and action based content. This provides tons of value for the first time visitor, and helps encourage long term brand loyalty. First things first, let’s warm you up with some inbound marketing stats from HubSpot that will totally blow your mind. B2B companies that blog generate 67% more leads per month than those who don’t. 80% of people admit to completely ignoring Google sponsored paid ads. 75% of search users never scroll past the first page of results. 61% of B2B marketers rate webinars as the most converting form of online content. 80% of company decision makers prefer to get company information in a series of articles vs. an advertisement. 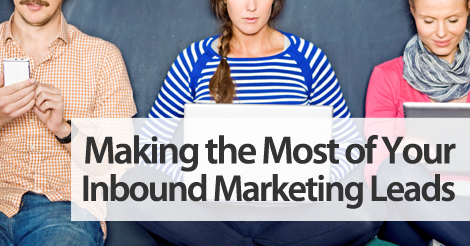 Let’s say you’re all about that inbound marketing life. We definitely don’t blame you. When you regularly pull users to your site, company, or product, you’ll find that brand loyalty drastically increases. But, beyond the initial touchpoint, what’s next? How do you keep engaging with inbound leads, day after day, week after week, month after month, and year after year? Start by prioritizing these three lead development techniques. Give SMS marketing a try. Did you know that 99% of all text messages are read within five minutes or less? That’s an irresistible open rate. When you use SMS to engage with new inbound leads, you can almost guarantee immediate interaction with your marketing messages. Remember, with SMS, it’s all about that valuable offer. Don’t text out generic announcements or day to day greetings. Send your subscribers exclusive, high value mobile promotions. It’s free, easy to use, and encourages real time conversation. Once leads have engaged with your brand, invite them to connect on social media. We’re all about building your digital marketing sphere of influence. You can never be connected on too many platforms. At the bare minimum, build up your Facebook, Twitter, and Instagram presence. All three offer a great return. When applicable, prioritize one on one interaction. Get this. We’re still huge fans of human to human interaction. Sure, we’re all about digital innovation, but when applicable, pick up the phone and give your clients/potential customers some personalized guidance. This can develop in the form of a consultation, planning session, product training, and more. Simply put, inbound marketing isn’t going anywhere. Capitalize on your inbound lead generation methods with the above three tactics.